Get a new look for less: Save thousands of dollars by painting—not replacing—your perfectly good (perhaps slightly outdated) appliances. Wishing for a way to refresh a kitchen or laundry room without sinking thousands of dollars into a renovation? 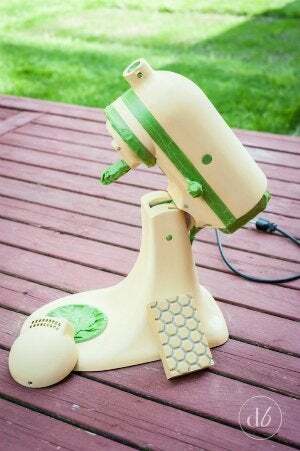 If your outdated appliances are still in good working order despite some small signs of a little wear and tear, consider this familiar store-bought solution: paint. Just as a fresh wall color can invigorate any space, so, too, can a brush of bold color or coat of stainless steel completely transform your current refrigerator, oven, dishwasher, or dryer. Painting appliances can cover up their scratches, update the finishes, and even extend their lifespans—all without breaking the bank. Yes, sprucing up your appliances can cost as little as $20, thanks to the power of paint. Depending on the appliance and its condition, you might need only a small bottle of specialized paint for touch-ups or an entire one-quart can for complete coverage. For long-lasting results and household safety, choose paints appropriate to your project. • One option—good for unifying the color of your appliances and hiding nicks or discoloration—is to cover it with appliance epoxy paint. Application couldn’t be easier for this self-priming paint, with options to either brush or spray, and you’ll find all of your standard appliance colors available. Rust-Oleum Specialty Appliance Epoxy Spray (view on Amazon) and Krylon Appliance Epoxy Spray (view on Amazon) are both popular, widely used examples of such products. • For appliances that do tend to heat up, like the oven or radiator, you’ll need to purchase a specialty heat-resistant product that is designed to withstand high temperatures. For “high heat” options, just like with regular appliance paints, Rust-Oleum and Krylon reign as the leading suppliers. • Want to paint your appliance an unusual color, something other than the standard white, black, and silver to be found in the appliance paint category? Consider using regular spray paint, followed by an application of clear enamel gloss protective spray. You’ve carried home your paint cans, but before you begin, remember: Safety first! Start by unplugging the appliance from the wall. Then, spread out a drop cloth and/or plastic sheets to protect your floors and surroundings. Remove all hardware (you’ll paint that separately) and give the appliance a thorough cleaning. A little ammonia works wonders to clean off any grease and oil buildup so the paint adheres properly. Just be sure to crack open a window and move some fans into the space for proper ventilation, as those fumes can be caustic. Leave these precautions in place if you plan to spray-paint indoors, or take this time to move the appliance outside before you clean and paint so that you won’t inhale any of the fumes. Next, rough up the surface of your appliance. While it may seem counter-intuitive to creating a fresh clean look, it helps the paint to bond to what’s likely already a slick, glossy surface. Rub a piece of steel wool in a circular motion across the entire surface of the appliance. High-gloss finishes may require an extra pass with 150-grit sandpaper or sanding block to really scratch up the surface and eliminate the shine. 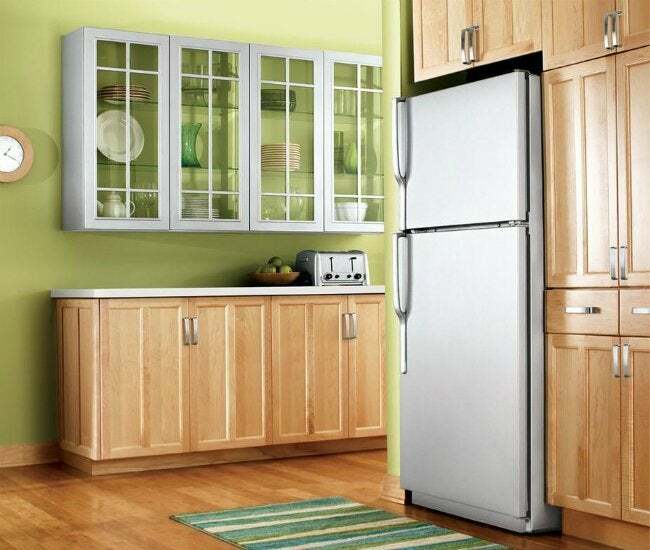 A clean, matte feel is the perfect canvas for a fresh coat of appliance paint. Take a damp cloth and wipe away all of the dust so it won’t interfere with your paint job. Now, strategically place painter’s tape to cover up logos as well as non-removable knobs and buttons. And speaking of cover-ups, you should mask your face to keep from inhaling fumes. While you’re at it, protect your skin with a long sleeve shirt and pants, especially if you’re using a spray can—this do-it-yourself project gets pretty messy! Once your appliance is properly prepped, spray, brush, or roll on the product of your choice. If you choose to spray paint, keep the nozzle at a constant level and at an even distance (approximately 12 inches from the surface) for best results. If you’re using a brush or roller, use slow and even strokes to fully coat the entire appliance. If you notice the paint (particularly epoxy) bubble up, no need to panic; in most cases it will even itself out. Once you’re done with the first application, plan to apply a second or third coat for a smooth, even finish. When spray painting appliances, you’ll most likely need 2 or 3 coats to ensure the surface is evenly covered, and one coat of enamel gloss protective spray if you chose to work with something other than specialty paint. Wait 15 minutes between applications, and when your satisfied with the results, allow your appliance to dry for 24 hours before touching—that includes hauling your masterpiece back inside. Painters who use a brush or roller may only require a second coat to give the appliance a smooth, even finish. While painting appliances is not a permanent fix, it does offer you additional time to budget and save for those replacement appliances you’ve been dreaming about all along.